My question was answered when we were led by local volunteers to a suburb of Durban, an hour away. There we saw another side of South Africa: squat brick houses, open-air markets covered with plastic tarpaulins held up by bamboo poles, children in shabby clothes, and small grocery stores housed in converted shipping containers. We saw mostly older people and small children as we walked into the community. This suburban area stood in sharp contrast to the thriving city scenes we had just seen when we drove away from the airport. “Welcome to the real Africa,” said volunteer Yuan Ya-qi (袁亞棋), who had lived in South Africa for 13 years. She told us that a wide gap existed between rich and poor in the nation. Even though apartheid ended in 1994, when Nelson Mandela became South Africa’s first black president, the effects of decades of discriminatory policies are still felt to this day. The scars left by history take time to heal. Most of the country’s black people, who make up the majority of the population, still live in poverty. 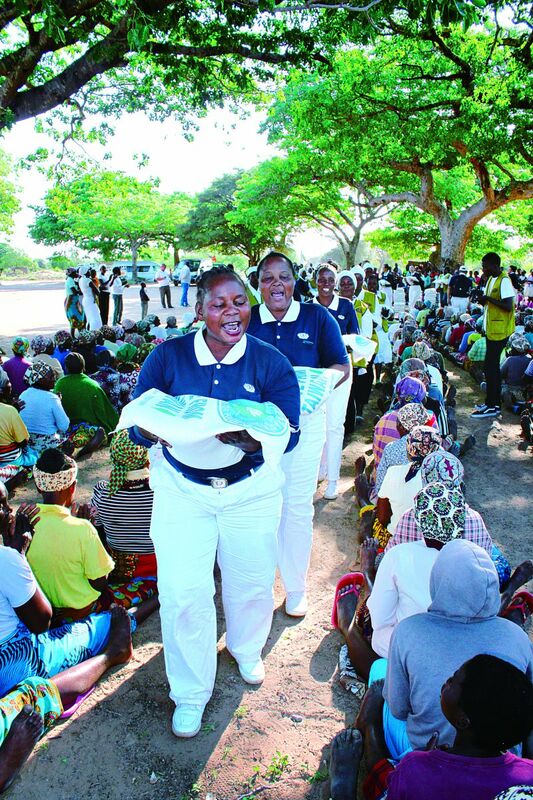 When we walked into the community of Nsimbini, we saw a community center built by Tzu Chi. The 355-square-foot building is furnished simply inside. Though small, it is an important base for local Tzu Chi volunteers and residents. Meetings are held there, food cooked for orphans, and rice from Taiwan is stored there too. (The Taiwanese government provides rice every year for government agencies and private aid organizations to distribute to needy people in other countries.) The center can even serve as sleeping quarters when there is a transnational Tzu Chi camp in the area. The center also acts as a place where local Zulu volunteers can sew clothes, bags, and accessories, the proceeds of which are used to support community philanthropic work. The plot of land on which the center stands was originally intended for the construction of a church. But a Christian pastor, moved by the Great Love spirit of Master Cheng Yen, decided to donate the land for Tzu Chi to build a community center. We next visited volunteer Beatrice Sibisi, 75, in Mkhazini. She was cooking outdoors for about 50 orphans and older people living nearby. Beatrice has volunteered for Tzu Chi for nearly 20 years. For a long time now, she has used her own kitchen to prepare meals for the needy. Other volunteers regularly deliver rice donated by the Taiwan government to her hot food station, and based on the amount of the rice, she calculates the portions for every meal. When there is not enough rice to go around, she makes “steam bread” to supplement it. She also cultivates a vegetable patch beside her hot food station to enrich the meals. Though she has undergone two surgeries for some injuries she sustained before, she is still very enthusiastic to help others. 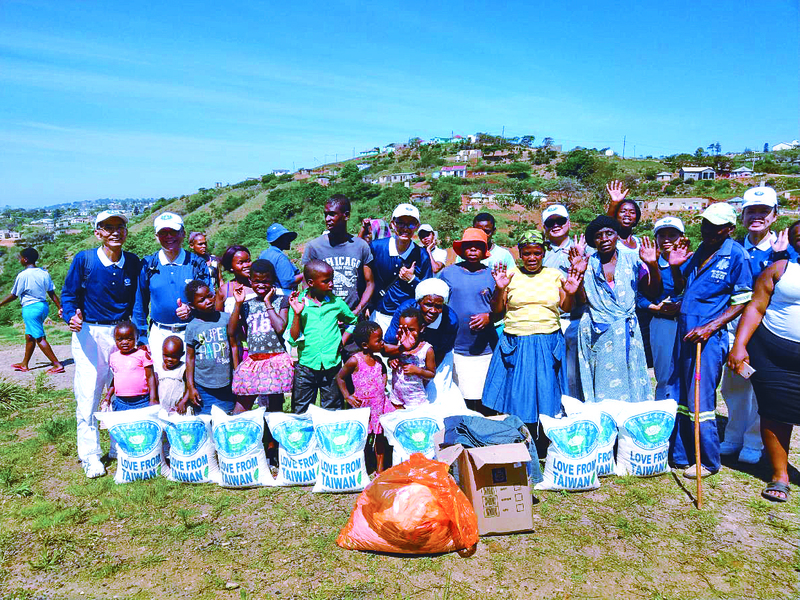 Nearly 200 Tzu Chi hot food stations are spread across the suburbs of Durban, with each station supplying meals from one day to three days per week. The stations feed about 5,000 people every month. There are just 15 ethnic Chinese Tzu Chi volunteers in Durban—the huge meal preparation work is undertaken by native volunteers. Besides providing meals, volunteers in Durban visit the homes of needy people every month. Nhlakanipho Mchunu and Samkeliso Magwaza are two major cadre members among the native volunteers. They are responsible for planning the routes of the home visits. They are both in their 20s, but their devotion to Tzu Chi work was inspired by the commitment of many older volunteers. They have seen how those senior volunteers wholeheartedly carry out Tzu Chi missions despite their limited mobility. Even though it is a challenge for them to cross the mountainous terrain in the countryside when they conduct home visits, they remain undaunted and keep going. Seeing their dedication, Nhlakanipho and Samkeliso were inspired to organize some local young people to join them and drive older volunteers every month to visit the needy. When they have to visit a place unreachable by car, they walk. The number of families in Durban receiving care from Tzu Chi has now exceeded 2,000. The Tzu Chi training center located next to the Lanseria Airport in Johannesburg is the foundation’s new base in the city. It was provided to Tzu Chi to use for free by volunteer Li Qing-long (李慶隆). 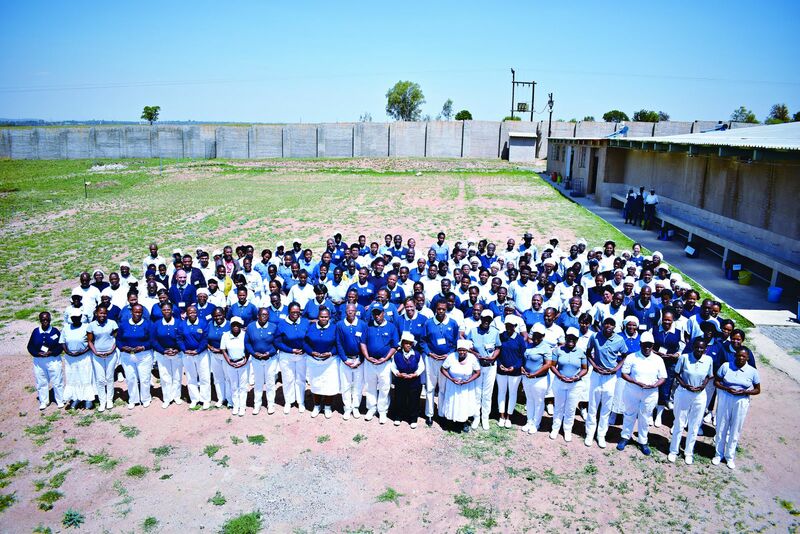 During our visit this time, an annual training camp was being held there for cadre volunteers from eight African countries: South Africa, Lesotho, Zimbabwe, Eswatini (also known as Swaziland), Mozambique, Botswana, Namibia, and Malawi. The camp lasted three days. A lot of care and work went into the preparation for the event. To accommodate sleeping arrangements for the 240 participants, volunteers obtained wooden pallets to serve as bed frames. They placed pieces of plywood across the top and added bedsheets on top of that to transform them into functional beds. Ethnic Chinese and native volunteers worked together to cook meals for the participants. Native volunteers also set up audiovisual equipment, prepared needed daily supplies, and kept the environment clean so that the courses could go smoothly. Participants listened attentively in classes, making good use of the time to learn Tzu Chi ideals, missions, and etiquette. Everyone said that when they returned home, they would try to inspire more people in their communities to work together to serve the needy. At the camp we met four volunteers from Namibia that we had previously met in Durban. They told us that they had almost missed the camp because they couldn’t afford the bus fare. Although Tzu Chi paid for them to travel from Namibia to South Africa, they did not have enough money to travel from their homes to the bus station. Because of this, they had originally decided not to attend the event, but volunteer Yuan Ya-qi kept encouraging them not to give up. With her encouragement, they successfully raised money for the fare. With further help from local Chinese volunteers, who footed the bill for their meals during the journey, they were able to make the trip. After traveling three days by bus, they arrived in South Africa. Local native volunteers are generally impoverished. For that, they are all the more admirable for being willing to join Tzu Chi and care for other disadvantaged people. After saying goodbye to South Africa, our delegation flew to our last stop for this trip: Maputo, the capital of Mozambique. We were led by Denise Tsai (蔡岱霖), a volunteer in that country. As we stepped out of the airport, we were struck by the sound of singing: About 40 local volunteers had formed a welcome party to greet us at the airport, and they were singing and dancing for us. We hugged one another when we met, and our visit to Mozambique began with very warm feelings and good cheer. Denise Tsai is from Taiwan, but she was the first person to join Tzu Chi in Mozambique. Largely due to her work, this African nation now boasts 3,150 native Tzu Chi volunteers. During our stay in this country, we took part in two rice distributions, one in Mahubo and the other in Hulele. Mahubo is about 90 minutes by car from the city center of Maputo. We arrived at our destination after driving on asphalt, then gravel, then dirt. When we arrived, aid recipients were already seated in neat rows in the shade of trees, greeting us with cheers and songs. In the distributions we had participated in before, the volunteers usually stood in place and aid recipients approached them one by one to receive their goods. But here in Mozambique, aid recipients sat on the ground while volunteers bowed and handed goods to them. This was an impressive gesture of respect towards the recipients. Before the distribution kicked off, a pastor led everyone in a prayer. Thus spiritual as well as material needs of the recipients were both tended to at the event. The other distribution was also heartwarming. Hulele is located just ten minutes by car from the Maputo International Airport. Though it’s just a short drive from the center of the city, it is a stark contrast to the magnificent beach houses not far away. At the distribution, volunteers explained the meaning of a Tzu Chi coin bank—how the foundation had started in Taiwan with 30 housewives each saving a little money each day in bamboo coin banks to help the needy. After hearing the explanations, almost every aid recipient took money out of their pockets and dropped it into the coin banks held out by volunteers. We were amazed. Despite their poverty, despite their own need, they all wanted to contribute what they could to help others in need. On October 30, some members of our delegation visited Ndlavela Primary School in Matola. Tzu Chi was going to build classrooms for this school, which was sorely in need of space to accommodate its 6,000 students. 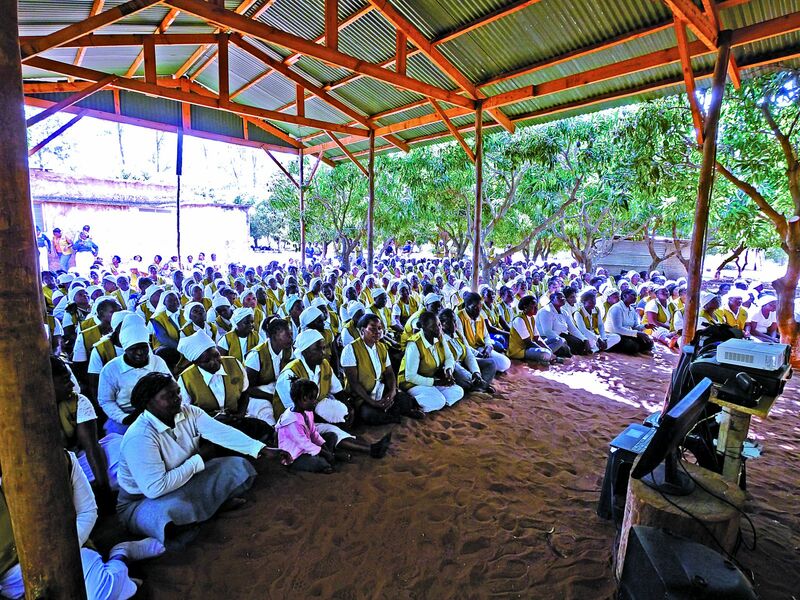 We were told that although compulsory education in Mozambique lasts seven years, students in public schools attend class in three shifts a day due to a shortage of classrooms and teachers. Each shift lasts three to four hours. A tour of the school helped us realize the problem of the severe lack of space. Every classroom we visited was jam-packed with students. The classrooms were so full that the only space left was in front of the blackboard, which allowed the teacher to move around. The children who sat on the ground around the podium had to constantly keep an eye out so their feet didn’t trip the teacher. Though the learning environment was far from satisfactory, we could sense the students’ thirst for knowledge from their focused expressions as they listened to their teacher. When we walked outside the classrooms, we saw several blackboards propped up every few meters against the outer back wall of the building. Students sat on the ground in front of the blackboards, absorbed in class. Our presence didn’t seem to bother them in the least. We counted a total of three classes in session. Some distance away, under a few large trees, sat more groups of students. We thought that they were in the middle of some outdoor activities, but we soon found out that they too were in class. Mozambique is one of the poorest countries in the world. In 1975 the nation gained independence from over 400 years of Portuguese rule, but after only two years of independence, it descended into an intense and long-drawn-out civil war, which lasted from 1977 to 1992. The economy collapsed as a result. 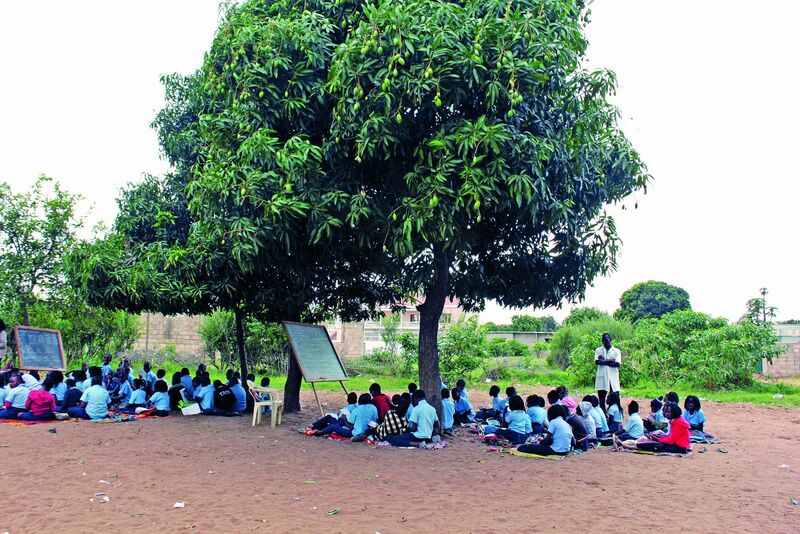 We could see the lingering effects of the war and the financial difficulties the nation faced in the makeshift learning environment at the school. Hopefully, with the help of Tzu Chi, the school’s students will soon have a better environment in which to receive an education. The trip to Africa left us with many cherished memories. What impressed us most of all was the willingness of the local volunteers to give to others despite their own poverty. They do not have much, but they do their best to help others. The aid recipients we met at the distributions also left a deep impression on us. They live in poverty, but they look content and happy. Their eyes told us: “Though I’m poor, I’m happy.” Local volunteers told us that after the recipients returned home, many of them shared the rice they had received with their neighbors. We found that astonishing. They had barely enough to eat, and yet they still shared what little they had with others. Looking at them, we can’t help reflecting on our own lives. We live in a rich, technologically advanced society, but despite our abundance, we constantly think about how to earn more money or get more stuff. In the rat race of life, we continually compare ourselves with others, thus becoming more and more unhappy. Maybe we can learn from the Africans we met. They showed us that a contented mind is truly a wellspring of happiness.